2GIG SP1 Has Been Released. Buy It Now! The all-new 2GIG SP1 Touchscreen Keypad has finally been released. This excellent device provides users with another access point to a 2GIG GC3 System. The new keypad offers all of the features and functionality of the 2GIG SP2 Keypad, along with some exciting new additions. Alarm Grid recommends this keypad for anyone who wants a new way to control their GC3 system while on-site. Please note that firmware version 3.1 or higher will be needed on the GC3 Panel to use the SP1 Keypad. The SP1 looks remarkably similar to the GC3 System. Just like the GC3, the SP1 features buttons for instant access to the home screen and emergency services. It features a beautiful, full-color 7-inch touchscreen display, making it a complete joy to use and control. It connects via WIFI, which provides it with a very impressive range from the actual GC3 System. Just like the SP2, the new SP1 can arm and disarm the system. It can also bypass zones as needed. However, the SP1 is also capable of some functions that could not be accomplished using the SP2. For one, the SP1 has full voice annunciation, which makes it easier for users to immediately recognize a faulted zone. The SP1 also provides a full weather display right from the main screen. This can be great for getting a quick update on what kind of weather to expect for the day. Another useful feature of the SP1 is its ability to connect to the network using an ethernet connection. This is not even possible on the GC3 System itself. But where the SP1 really shines is in home automation. While the SP2 cannot perform any home automation actions, the SP1 can conduct the same home automation functions as the GC3 system. With the SP1, you can create and execute scenes, establish rooms and bookmark screens. This means that the SP1 boasts all of the security and automation capabilities of the GC3 Panel itself. In fact, you will really only need the GC3 System for making programming changes. The 2GIG SP1 Keypad is available for purchase right now on the Alarm Grid website. Door contacts are some of the most important sensors used with security systems. Anyone with a complete security setup will want to know when their door is opened. Many intruders walk right through the front door of a person's home or business. Protecting this opening is critical. That is why door sensors should always be checked for proper working order. Security systems use two types of door sensors. These are wireless sensors and hardwired sensors. There are also countless companies that produce door sensors. For this article, we will be focusing on Honeywell wireless door sensors. These sensors use batteries to stay powered and communicate with the panel. A sensor will not be able to communicate with the panel if its battery runs out of power. Replacing these batteries before this happens is vital to maintaining a working setup. The security panel should notify the user when the battery for a sensor is low. When this message is displayed, replace the battery as soon as possible. This will prevent the sensor from losing function due to a dead battery. Honeywell makes determining the correct door sensor battery easy for end users. Honeywell wireless door sensors almost always use one of three types of batteries. These are CR123A lithium batteries, CR2032 coin batteries and AAA lithium batteries. Larger surface-mount wireless door contacts often use CR123A lithium batteries. Meanwhile, smaller surface-mount sensors will either use AAA batteries or CR2032 coin batteries. This is also true for recessed sensors. B ut these guidelines are only a general rule of thumb. The best way to determine which type of battery to use is to check. Remove the back cover for the wireless door sensor, and check to see what type of battery it uses. This can be seen by looking at the battery terminal and checking to see what type of battery would fit. If it requires a flat, circular battery, then it needs a CR2032 coin battery. If it requires a larger, cylindrical battery, then it needs either a CR123A battery or a AAA battery. A CR2032 is a small 3-volt coin battery that is most often used for smaller devices. These batteries have this name because of their coin shape. The compact size of these batteries makes them appropriate for powering thin sensors. Honeywell makes their own version of these batteries called the Honeywell CR2032. Other electronics companies also often produce their own CR2032 batteries. Any of these batteries will work fine. They are all lithium-powered, and they will maintain power for three to five years. The important thing is to make sure that they are the CR2032 size of batteries. Sometimes, these batteries will be labeled as "2032" batteries instead of "CR2032" batteries. This is fine, as CR2032 and 2032 refer to the same type of battery. The type of battery to avoid is a CR2025. This type of coin battery is thinner than a CR2032 battery. A CR2025 battery may not fit with a Honeywell wireless door sensor. These batteries are often confused with CR2032 batteries. It is very important to make sure that the coin battery is a CR2032. The CR2032 batteries are generally used with smaller sensors. These are usually recessed sensors or very thin surface-mount sensors. A recessed sensor is a door sensor that is inserted into the door frame. This takes it out of view to improve aesthetics. A surface-mount sensor is placed on the outside of the frame for an easy installation. CR2032 batteries are best for sensors that are too thin to contain other types of batteries. One of these contacts is the Honeywell 5800MINI Door Sensor. Another one is the 5800RPS Recessed Sensor. Other small sensors that are not as thin may use AAA batteries instead. When in doubt, check the battery terminal to see which type of battery will fit. In most cases, a very thin sensor will use a CR2032 coin battery. If it can contain a AAA battery, then it will most likely use that type instead. This can be somewhat confusing, but checking the terminal should ease any doubts. The manual for the wireless door sensor should also state which type of battery is needed. There are a few things to note about AAA batteries. The first is that they can either be lithium or alkaline. We recommend using lithium batteries. Alkaline batteries will also work, but they will not last as long. Lithium batteries will reduce the need for replacements, keeping the sensor functioning longer. Check the packaging of the battery to see whether it is lithium or alkaline. The battery itself may also present this information. Many people may also confuse AAA batteries for other types. The cylindrical shape of AAA batteries is very common. In fact, CR123 batteries also have this shape. Look on the battery itself, and check for the size. Remember, AAA batteries are long and thin. CR123A batteries are short and fat. Again, check the packaging or the battery itself. And if it doesn't fit, then it isn't the correct size. AAA batteries are most often used in long, skinny sensors. These sensors can accommodate their shape. The Honeywell 5818MNL Recessed Door Sensor is a contact that uses AAA batteries . Another is the Honeywell 5820L Surface-Mount Slimline Sensor. Most AAA lithium batteries can be purchased at a retail store. CR123A batteries are also used with Honeywell wireless door sensors. These are shorter and fatter batteries with a cylindrical shape. They are most often used in larger surface-mount sensors. These are thicker sensors that can accommodate their size. One such contact is the Honeywell 5816 Door and Window Sensor. Another contact is the Honeywell 5917CB Commercial Sensor. A great type of CR123A battery to use is the Panasonic CR123A 3-Volt Lithium Battery. This battery is known for its long life and reliability. It is an excellent choice as a CR123A battery. Most CR123A batteries maintain a lifespan of about three to five years. After that, the battery will need to be replaced with a new one. Remember to make sure that the battery is a CR123A size before purchasing. The battery may also be labeled as CR123. This is fine, as CR123A and CR123 refer to the same type of battery. Again, the manual for the sensor should let you know if a CR123A battery is needed. Make sure to check the manual if there is any doubt about what type of battery to use. For a complete list of which type of battery to use with a Honeywell wireless door sensor, please consult this guide. The Honeywell Lyric Thermostat is an excellent smart thermostat that is designed to connect with a user's Total Connect account and their Lyric Controller security system. The device features WIFI connectivity, allowing it to become a fully integrated part of a user's home automation setup. Once the Lyric Thermostat has been installed and programmed, the user can control the device remotely by using the Total Connect mobile app. Many users appreciate the geofencing capability of the Lyric Thermostat. By setting up geofencing, a user can have their Lyric Thermostat automatically start heating or cooling their home when they enter within a specific range of their residence. By the time they return home, their house will already be set to the perfect temperature so that they are comfortable as soon as they walk through the door. Not only is this super convenient, the money saving potential is absolutely tremendous, with some users saving hundreds of dollars per month on their electric bills. The Lyric Thermostat can also be set up to function with various smart devices, such as Apple HomeKit, Samsung Smartthings and Amazon Alexa. 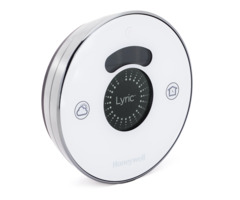 All of this makes the Lyric Thermostat an excellent addition to any home that uses the Honeywell Lyric Controller. Before you can enjoy all of the exciting features that the Lyric Thermostat has to offer, the device must be installed and programmed with your Total Connect account. This guide will focus on the removal of your old thermostat and the installation of the the Lyric Round Thermostat. For more information on integrating your Lyric Thermostat with Total Connect, please consult the Lyric Thermostat enrollment guide. You can also use the Lyric App to help walk you through the installation process. If you do not have the Lyric App, you can download it for free from the App Store or Google Play. You can make a Lyric account to use with your Lyric thermostat. We strongly recommend following the instructions outlined in the app as you complete the installation.